Ava and Squishy have a wonderful day of mischief and mayhem planned in the glorious outdoors when mum gives them a nasty surprise. They are to go to the supermarket with mum and doe other chores. 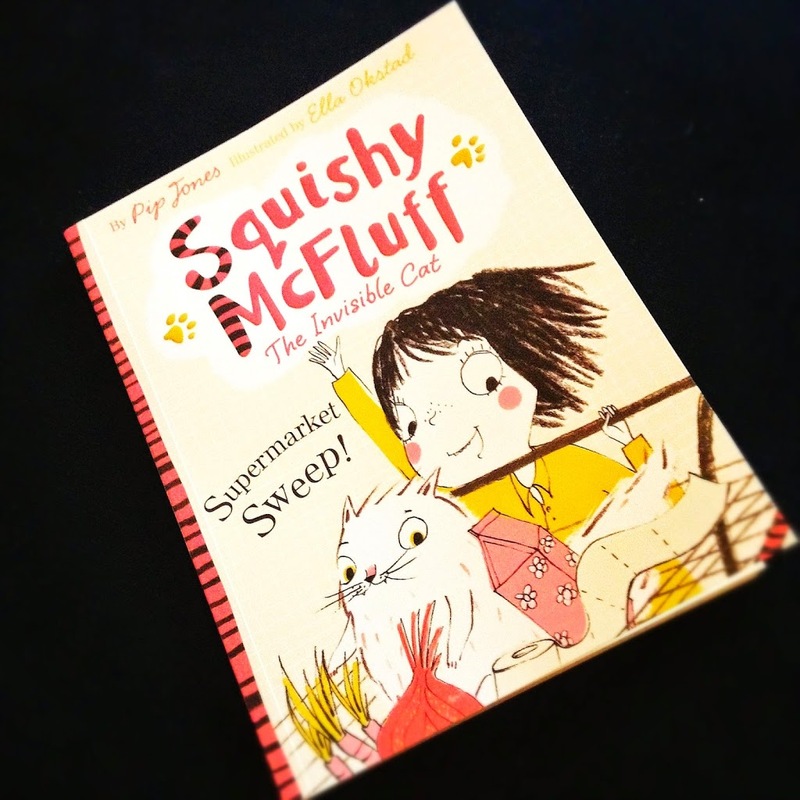 It sounds so boring but never fear, for the world is always fun when Squishy McFluff is near! Yet another adorable, beautiful and fun book from Pip Jones and Ella Okstad! I don’t care that I got laughed at for reading a babyish book by my partner and stepson (who’s 14 so will laugh at anything!) because it was worth it for the awesomeness of Ava and Squishy. The story is, well its pretty basic. Ava and Squish get forced to go on a food shopping outing with Ava’s mum and because its boring they make their own fun. I loved the sound of what they were doing and it made me laugh so much but at the same time I know I would go mad if it was my own kids doing that. The whole outing turns into a crazy mess for Ava’s mum and it takes a long time to get the food shopping done! The most important thing about this book is to obviously engage with kids with language they will love and that they will want to return to. It really manages that with a brilliant singsong rhyme scheme and I really loved floating through it. Some of the rhymes were a bit forced for me but thats probably more to do with accent and the way that some words are said differently for me than they may be for others. The pictures were as wonderful as last time and I love how the invisible Squicky McFluff is portrayed in the book with a translucent colour and a mischievous look in her eye. This book is made for every kid and I am definitely planning on keeping it for my own when they eventually arrive! Thanks to Faber & Faber for this book, which was published on August 7th and sent to me in exchange for an honest review.